While most days I opt for the less expensive side of haircare, every now and then adding in some professional salon quality products can really make a difference. Plus, who doesn't love a little treat every now and then? The Catwalk by TIGI range as you can imagine helps to recreate the hair styles and textures we see at fashion week, whether you want to go all out or have super sleek hair.. there's a huge range of products to try. Here's some I've been trying out lately. First up we have the TIGI Catwalk Oatmeal & Honey Nourishing Shampoo which comes in a 300ml sized bottle. This shampoo is aimed for dry to damaged hair in need of a moisture boost. I tend to go through shampoo much quicker than conditioner so I love that this comes in a slightly larger bottle. The shampoo itself smells amazing, sweet but not sugary. It reminds me of the Label M Honey & Oats range. It's said to be colour safe however as it does contain sodium laureth sulphate.. I'm not so sure I 100% believe that claim. Aside from that, it lathers well and it doesn't take much product to clean your hair. While the shampoo does a great job nourishing on its own, to finish it off I used the TIGI Catwalk Oatmeal & Honey Nourishing Conditioner. This comes in the slightly smaller 200ml bottle but you really don't need much product to make a difference. The scent is exactly the same as the shampoo, maybe slightly stronger. While I have no issues with the conditioner itself, the bottle design does make it slightly difficult to get the product out once you've used it a few times so I'd recommend storing it upside down and let gravity work it's magic! The shampoo and conditioner are great on their own but together, even better. You can actually buy the two for much cheaper as a gift set also! We all know how difficult it can be to style freshly washed hair but the TIGI Catwalk Bodifying Spray solves that problem. Personally if I have an event to go to, I can't show up with unwashed hair so this product basically gives you the second day hair hold you need for more complex hairstyles. All you need to do is spray only damp hair, blow dry and it gives your hair a more structured, fuller texture to work with, a perfect step before breaking out the hair curlers. 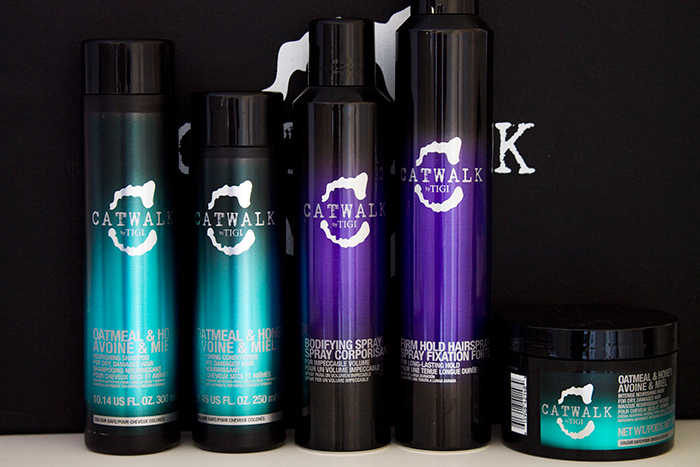 What would a catwalk inspired range be without hairspray? The TIGI Catwalk Firm Hold Hairspray is probably one of the most effective hairspray's I've ever used. Plus in conjunction with the bodifying spray, means your hairstyle won't be budging anytime soon. I used the combination for my halloween dress up day in work and my hairstyle lasted me through the day to night. If you prefer hairsprays with a lighter texture then this won't be for you but if you need something effective and long lasting, look no further. Last but not least is the TIGI Catwalk Oatmeal & Honey Nourishing Mask which may be my favourite product out of the catwalk range. It has the same scent as the shampoo and conditioner from the range, though slightly stronger. It has a light texture which means it's easy to spread over the hair and fairly easy to rinse out too. I've used a lot of hair masks and I can easily say I've never felt my hair feel so silky and smooth before using this product. If your hair is feeling dry and damaged, this stuff will bring it back to life. If you pick up anything in the range, make sure it's this product!